SALT LAKE CITY, UT--(Marketwire - Sep 11, 2012) - Utes football fans can get their game face on and let the fun begin with a grand tailgate party before home games, thanks to a Tailgate Party series presented by a stylish Salt Lake City, Utah sports bar. The Utes football tailgating frenzy at the Salt Lake City Marriott University Park hotel kicks off three hours before each home game in the hotel's lower parking lot, where Allie's American Grille lays out a buffet of hamburgers, hot dogs, chips and more. A cash bar with $3 drink specials is also included so guests can enjoy the fun, but avoid the mayhem. After partaking in food and drinks, enjoying the games, music and Utes camaraderie, party guests of this sophisticated hotel near Rice-Eccles Stadium are provided with complimentary shuttle service to and from the stadium entrance for added convenience. Tailgating party tickets are just $5 and entitle fans to three hours of fun, food and shuttle service so they can party worry-free. Allowing guests to maintain the excitement of Utes football fever without being forced among the masses, the Salt Lake City Marriott University Park hotel is ideally located just steps from the University and only 15 miles from the airport. 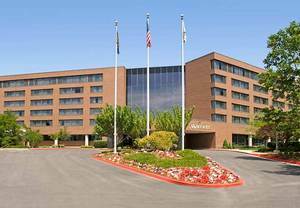 In addition to meticulous guest rooms, this Marriott offers comfortable hotel suites in Salt Lake City, Utah so Utes fans can enjoy opulent accommodations that best fit their travel needs. While many rooms offer picturesque views of the Wasatch Mountains and the surrounding valley, guests are pampered with gracious amenities starting with soundproof windows and luxurious bedding ensembles over pillow top mattresses. Added features include marble bathrooms with Neutrogena toiletries, cable/satellite service with premium movie channels, pay-per-view movie options and room service. High-speed Internet access is also available as well as a concierge level for added services. Before and after the game Ute fans can revel at Allie's American Grille, located inside this premier Salt Lake City, UT hotel, where floor-to-ceiling windows continue the fabulous views and a menu of American favorites is offered daily for breakfast, lunch and dinner. Hand-crafted cocktails, comfortable seating and a relaxed atmosphere make Allie's an ideal spot for gathering with family and friends. Utes enthusiasts will also find a vibrant game day atmosphere at Pitchers Lounge, open daily for dinner and evening drinks. With these two eateries located on-site, along with a Starbucks Coffee House, guests are sure to find plenty of comfortable spaces and enticing flavors to meet the demands of football weekends, business meetings and family vacations. For more information on Utes Tailgating Parties at the Salt Lake City Marriott University Park, call 1-801-581-1000. Tailgating dates include September 15 vs. BYU, October 4 vs. USC, Oct. 27 vs. California, November 3 vs. Washington State and November 17 vs. Arizona. The Salt Lake City Marriott University Park Hotel welcomes travelers with exceptional convenience and astounding value while providing gracious accommodations and renowned Marriott service. Whether traveling for business or leisure, guests of this full-service lodging will find themselves just steps away from the University of Utah, Hogle Zoo and Red Butte Gardens and Research Park, while enjoying easy access to the Salt Lake Palace Convention Center, Temple Square and the Mormon Tabernacle Choir. Utes football fans can get their game face on and let the fun begin with a grand tailgate party before home games, thanks to a Tailgate Party series presented by a stylish Salt Lake City, Utah sports bar.